The UN Security Council (UNSC) will hold an emergency meeting Friday on the status of the city of Jerusalem at the request of eight states after President Trump Wednesday defied international warnings and declared the old city capital of Israel. The Arab League Ministerial Council will, on its part, hold an emergency meeting Saturday in Cairo at the request of Palestine and Jordan with Morocco’s support. Sweden, France, Senegal, Bolivia, Egypt, Britain and Uruguay called the emergency meeting. The Arab League Ministerial Council will review developments regarding the US president’s announcement of his country’s recognition of the city of Al Quds as the capital of the Israeli occupying state. President Trump in an address Wednesday materialized an electoral promise declaring Jerusalem capital of Israel and announcing transfer of the US embassy from Tel Aviv to the disputed city, which has been enjoying special status since June 1967. Trump’s decision breaks years of US foreign policy that remained consistent with the UN SC’s stance on the old city. 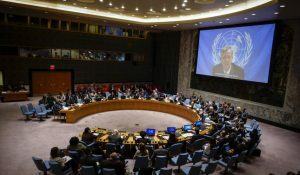 Speaking a little while following Trump’ declaration, UN Chief Antonio Guterres noted that the status of the city can only be changed by Palestinians and Israelis through negotiation. “In this moment of great anxiety, I want to make it clear: There is no alternative to the two-state solution. There is no Plan B,” he said. “I will do everything in my power to support the Israeli and Palestinian leaders to return to meaningful negotiations,” he said. The UN Chief is invited to open the Security Council meeting. The Bolivian envoy Sacha Sergio Llorenty Soliz slammed Trump’s decision calling it “reckless” and “dangerous” which flies in the face of the international law and the resolutions of the UN Security Council. Protests broke out few hours across the Middle East, Muslims and Arabs from Gaza, the West Bank, and Jordan to Turkey took to the streets to condemn the univocal move. “These deplorable and unacceptable measures deliberately undermine all peace efforts,” the Palestinian President Mahmoud Abbas said. Several Palestinian figures have called for ending any cooperation with the Trump Administration and for withdrawal from Oslo accord.